To get the most out of this post, I’d suggest reading these two earlier posts [LINK] and [LINK]. 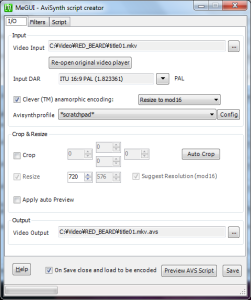 Using MeGui to convert a video file requires the following steps. I’ll cover each in detail and will provide screen shots where applicable. So, let’s get down to the first step. From the main gui, head over to the “Tools” menu and chose “AVS Script Creator”. You can also get here using the Crtl+R key combination. Click the “…” button next to “Video Input” (near the top of the window), and you’ll be presented with a file dialogue. Choose the file you want to read and MeGui will ask you how you wish to open with the file. You’ll want to chose “File Indexer”. The reason for choosing “File Indexer” over the other options is because I’ve found that MeGui handles separate files better. It’s parser seems to work better when working on individual files for the audio and video streams rather than pulling them, when needed, from the source file. This will bring up the File Indexer options page. Unless your source file has multiple audio tracks and you wish to not have them in your output file, then just hit the “Queue” button. 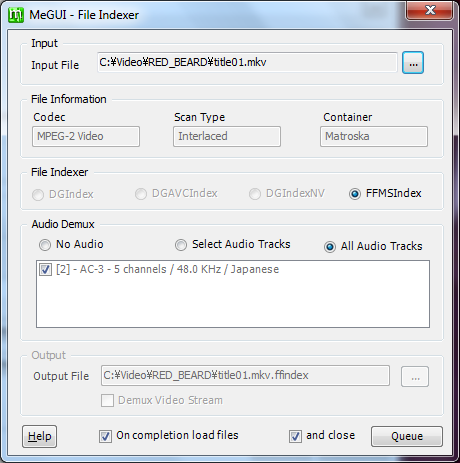 This will add the file indexing step to MeGui’s queue system. Head over to the Queue tab on the main MeGui window and hit the “Start” button to have MeGui begin to index your source file. Once indexing has completed, you will be presented with the Script creator again. However, this time a whole bunch of values will be populated for you. 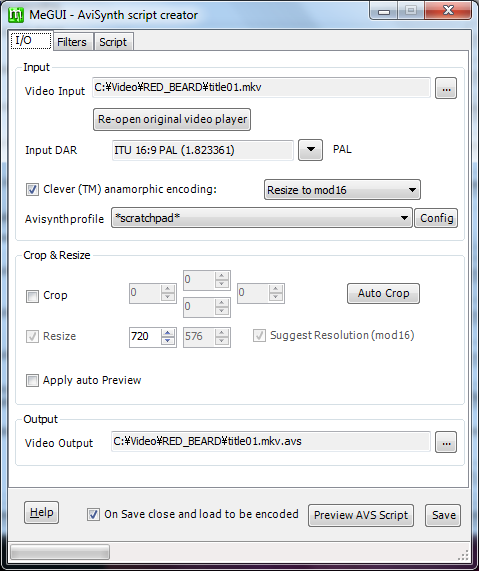 Note: on newer versions of MeGui, to enable resizing to mod16, you will need to check the “Resize” box, and select “mod16” from the drop down on the right of the resolution input boxes. The window might be hidden behind a preview of the input file. You will ave to close the preview to get to the script generator. Head over to the “Filters” tab and hit the “Analyse” button. 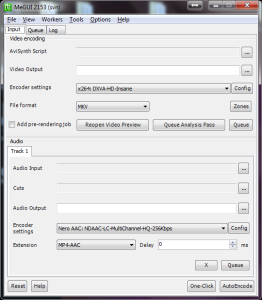 This will force MeGui to take a look at the video portion of the file and do it’s best at interpreting it’s type. This will help MeGui, greatly, in producing a nice looking output file. Once the text value at the bottom of the screen reads “Analysis finished!” you can click on the “Save” button. This will save the script to disk, then produce a preview of the expected output file. This next step is crucial in creating a fiel with the correct aspect ratio. Before you dismiss the preview window, check the box that reads “Preview DAR”. I have no idea why, but if you don’t check this box, then the aspect ratio of the outputted file will be messed up. Once you have closed the output preview window, you will be presented with MeGui’s main window again. Head over the “Tools” then “Bitrate Calculator” (or hit Ctrl+B) to bring up the calculator. 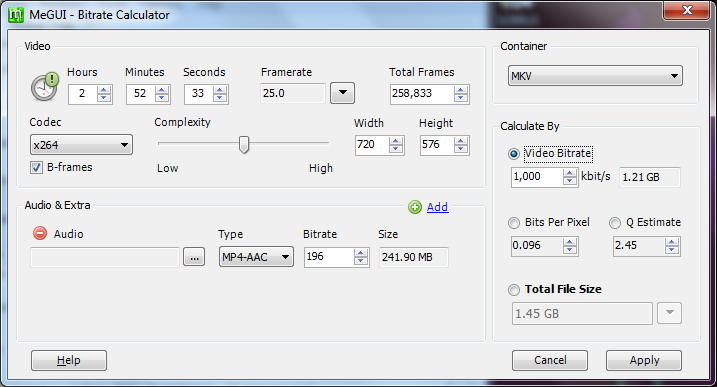 I usually set a video bitrate of 1000 kbit/s. This should produce a nice looking video without being too huge. Feel free to experiment. Lower values will produce smaller files, but they will have less visual quality. When you are done, hit the “Apply” button. 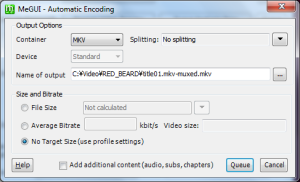 MeGui will ask you whether you want to apply the new bitrate settings, you’ll want to choose “yes”. 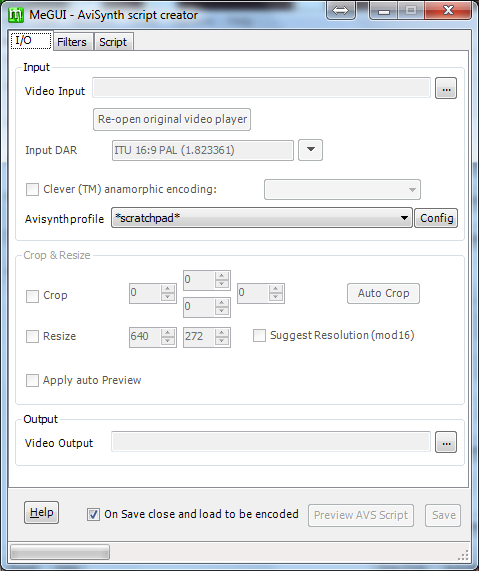 Again, once you’re back on the main MeGui page, hit the “Auto Encode” button at the bottom of said window. Make sure that you have “MKV” set as the container and “No Target Size (user profile settings”) checked. 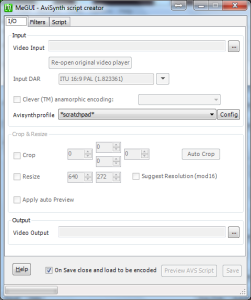 Now hit “Queue” and the new encode will be placed on MeGui’s queue system. One last step: head over to the “Queue” tab on the main MeGui interface. Then hit the “Start” button. 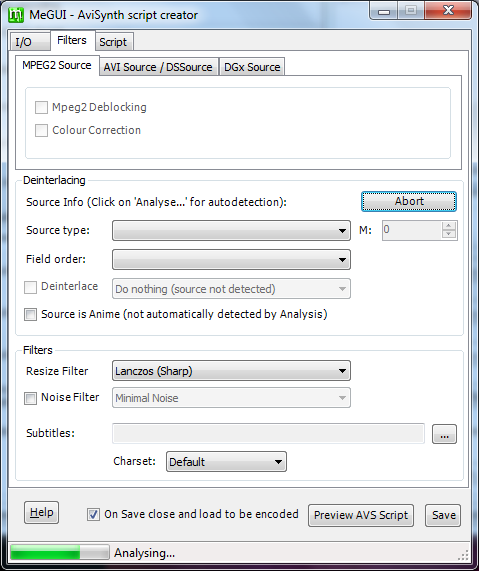 MeGui will then start to encode your new file. This could take a long time, so depending on your system set up. 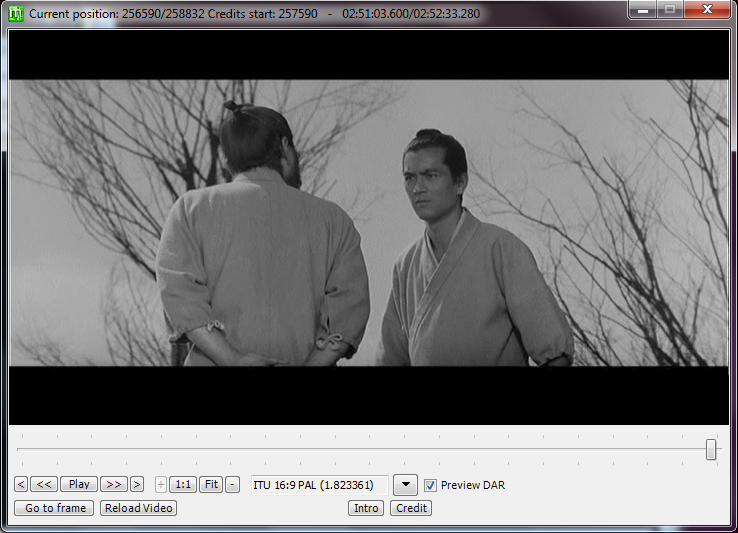 On my machine (Windows 7 x64, Intel Core i5-2500k with 20Gb of RAM) a movie conversion will take 30-45 minutes. A single episode of a TV show will take 5-10 minutes. And that’s about it. Once you’ve gotten good at using MeGui you can start to use workers (workers are separate work threads for MeGui). I have one worker for file indexing and one for encoding. I’ve gotten to a point where I can have a whole season of a TV show being encoded, whilst I prepare the next season.